This month Dan and I are eating a little differently. Part cleanse, part elimination diet, part recipe-creating challenge, we’ve cut some things out to shock our bodies and our habits. We’re 8 days in and I’m split between loving it and thinking it’s stupid. Basically, we’re doing no meat, no booze, and low carbs. The low carbs has been umbrellaed to mean both no processed grain and very few whole grains. I really want a super fluffy pancake. What I have enjoyed, however, is the challenge of coming up with meals that fit into this very limited scope. I’ve been experimenting a lot (I made cauliflower falafel!) and we’ve both tried things outside our comfort zone. I think that even after May 1st we’ll keep some of these recipes in our canon. 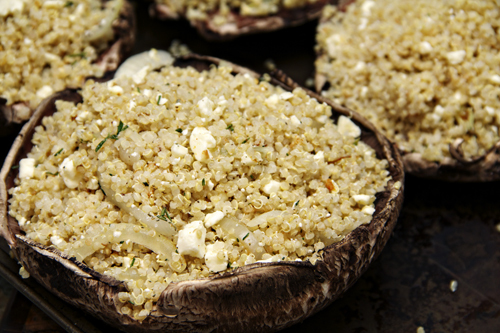 Tonight’s dinner, for instance, is portabellas stuffed with quinoa, feta, and shallots. Simple, delicious, and extremely full of good. Cook your quinoa. Stem and gill your mushrooms. In butter, sauté shallots (sliced) and rosemary (chopped) until tender. Mix together quinoa, feta, shallots, and spices. Place the mushrooms top down on a baking sheet. Fill them with quinoa mixture. Drizzle with olive oil and top with grated parmesan. 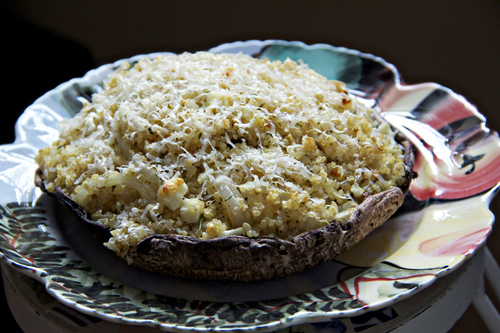 Bake at 350 for 25 minutes or until the mushrooms are tender. I have fallen in love with Quinoa and love the mild nutty flavor. I think I’ll add some cilantro or flat parsley on top for some color. Thanks for posting this recipe.